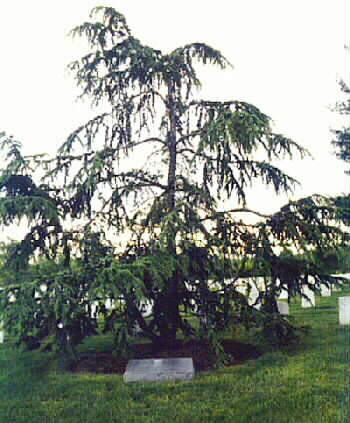 In the green expanse of Arlington National Cemetery's Section 59, a Lebanese cedar tree grows near the final resting place of some of the first Americans to shed blood in the fight against Middle East terrorism. Former Navy journalist Joe Ciokon of Poway was sleeping next door to the Marine barracks in Beirut, Lebanon, that were hit by a suicide bomber 25 years ago today. After scrambling to locate survivors, he was ordered to take up his camera and record the scene. 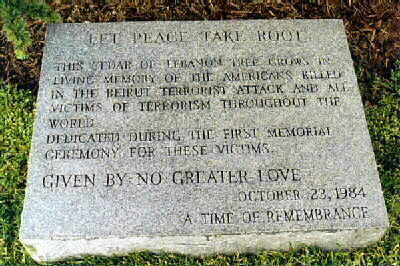 Twenty-five years ago today, a suicide bomber steered a truck loaded with the equivalent of six tons of TNT down the airport road in Beirut, Lebanon. He plowed into the four-story barracks where more than 300 U.S. troops from a U.N. peacekeeping mission slept and detonated what the FBI called the largest non-nuclear bomb in history. The explosion and fireball pulverized the concrete fortress, killing 241 U.S. service members, most of them Marines. A second blast minutes later at the compound of the French peacekeeping force killed 58 more Western troops. Three months later, President Ronald Reagan pulled the Americans out of Beirut. A quarter-century and two wars with Iraq have dulled the public's memory of the Beirut attack. But the United States and its allies still feel the effects, said retired Marine Col. Tim Geraghty, who commanded U.S. forces in Lebanon at the time. A splinter group of the Iranian-and Syrian-supported Hezbollah organization carried out the attack, which allegedly was planned by a man who later inspired Osama bin Laden. Then a tiny guerrilla outfit, Hezbollah has grown into a political and military force in Lebanon. Most of the 1,500-man Marine expeditionary force was bunked in a four-story concrete building. 241 died: 220 Marine Corps, 18 Navy, three Army. It was the largest single-day loss of life for Marines since the World War II Battle of Iwo Jima. A nearly simultaneous explosion nearby killed 58 French soldiers. One of two alleged plotters, Imad Mugniyah, was killed by a car bomb in Syria on February 12, 2008. Geraghty sees a line from the Beirut bombing through the al-Qaeda terrorist attacks of September 11, 2001 – and ultimately to the U.S. war dead from Iraq and Afghanistan, hundreds of whom are buried in Arlington's Section 60, a few hundred feet from those killed in Beirut. Joe Ciokon, now 69 and living in Poway, was a Navy Senior Chief at the time, the highest-ranking of 128 enlisted sailors who worked alongside the Marines in Beirut. A Navy journalist, he was in charge of the tiny television and radio detachment. It still frustrates him that the two-year mission ended in death and failure. The Beirut mission started out as an effort to stabilize a fragile peace in a war-torn country. Lebanon had been in turmoil since the Palestine Liberation Organization, having been expelled from Jordan, took refuge there in the 1970s. In 1975, a panoply of Christian and Muslim militias, some backed by neighboring powers such as Iran, Syria and Israel, turned what had been a Middle East oasis into a no-man's land of urban warfare. Israel invaded in 1982, hoping to crush the PLO. In exchange for an Israeli withdrawal, the U.N. sent in a peacekeeping force made up of troops from Great Britain, France, Italy and the United States. U.S. forces set up camp at Beirut International Airport, a spot difficult to defend because the airport remained open for business and because warring factions controlled strategic hillsides nearby. He bunked most of his men, who were from the 24th Marine Amphibious Unit at Camp Lejeune, N.C., in a sturdy, four-story concrete building that had once been the PLO headquarters. The situation fell apart quickly. Militia leaders began to view the United States and its allies as favoring the Christian-led forces of the Lebanese government. A car-bomb attack at the U.S. Embassy in April 1983 that killed 63 people emphasized the point. Geraghty felt the growing danger in the weeks before the barracks bombing. Artillery shells fell on his compound. Snipers took potshots at his men. But Geraghty's Pentagon superiors spiked his requests for stronger defenses. On October 22, 1983, Ciokon had moved his broadcast detachment from tents next to the barracks to a neighboring building, the Marine Safety Headquarters. That night, about midnight, he climbed to the roof of the Marine barracks. He watched as the local militias lobbed shells at one another. Ciokon slept soundly – until the blast catapulted him out of his cot at 6:22 a.m. Oct. 23. At first Ciokon thought an artillery shell had struck his building. He raced outside with his roommate, a newly minted Navy chief. The barracks next door had collapsed into rubble. Everyone in the compound scrambled to pull survivors out of the building. Within an hour, though, Ciokon's superiors told him to organize his broadcast team and get the radio station back on the air. They traded their shovels for cameras and recorded the carnage. Twenty-five years haven't erased the memories. The Marines' departure brought Beirut no peace. The civil war raged for seven more years until a settlement left Syria firmly in control of the country. Experts believe Imad Mugniyah played a key role in the twin bombings and went on to mastermind the 1985 hijacking of TWA Flight 847 and a series of kidnappings of Americans in Lebanon. He is believed to have met with bin Laden in Sudan in 1996 and was assassinated in a car bombing in Damascus, Syria, in February. No one has claimed responsibility. Today Ciokon and Geraghty will join hundreds of other Beirut veterans for a candlelight vigil at Camp Lejeune, near a monument listing the names of all who died. A Marine stands perpetually at guard. symbolizing the nation in which they died. A remembrance ceremony was held at the Arlington National Cemetery Saturday to remember the Marines who were victimized by a gruesome terrorist attack 21 years ago. On October 23, 1983 at 6:22 a.m., a large delivery truck drove to the Beirut International Airport where the Marine Barracks was located. After turning onto an access road leading to the compound, the driver rushed through a barbed-wire fence, passed between two sentry posts, crashed through the gate, and slammed into the lobby of the barracks. The driver detonated explosives with the power equal to more than 12,000 pounds of TNT. The explosion crumbled the four-story building, crushing service members to death while they were sleeping. The terrorist attack killed 220 Marines and 21 other U.S. service members who were stationed there to help keep the peace in a nation torn by war. It was the bloodiest day in the Corps' history since World War II, when Marines fought to secure Iwo Jima. On the 21st anniversary of the bombing, the ceremony began with words from the Master of Ceremonies, retired U.S. Navy captain, Capt. William Perry. He explained how one comrade expressed what it was like to lose a friend. Following the captain's opening statements were commentary from several speakers including the 29th Commandant of the Marine Corps, retired General A. M. Gray. During the somber ceremony, they spoke about the Marines who went to Beirut on a peacekeeping mission, and that their actions should not be forgotten. "That is why we're here today," said Carmella LaSpada, director, White House Commission on Remembrance, "and why we'll be here next year, and each year after that." Gray repeats the words spoken to him by former U.S. President Ronald Reagan at a funeral service at Marine Corps Base Camp Lejeune, North Carolina, following the bombing. "Our former warriors have now joined a long line of Soldiers of the Sea who have given their lives in the service of a grateful nation," said Reagan. "They had one simple mission," said Gray. "They came (to Lebanon) in peace, and they wanted to provide an opportunity for people to live in peace. Afterward, students from Mt. Vernon High School's Marine Corps Junior Reserve Officer Training Corps in Alexandria, Va., marched onto the gravesite where 21 out of the 220 Marines killed were laid to rest. They placed a rose on each gravestone and immediately thereafter, saluted to show respect for those who gave their lives. 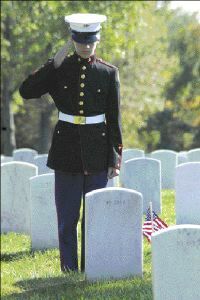 A wreath-laying proceeded in which a Marine lance corporal, in his dress blue uniform, marched slowly to a memorial stone marking the spot of the site. He placed the wreath alongside the stone and a Lebanese cedar, symbolizing the nation where the Marines died. "We pledge that we would never forget their memories, their sacrifice," said Gray. ARLINGTON, Virginia - Under cloudy and chilly skies, diplomats, Marines and some family members who lost loved ones to terrorism gathered at Arlington National Cemetery Thursday to remember service members killed in the October 23, 1983, blast at the Marine barracks in Beirut, Lebanon. The somber ceremony, coming on the 20th anniversary of that horrific truck bombing, took place in an area of the cemetery where 21 of the 241 U.S. service members killed by the blast are buried. A memorial stone marks the spot, along with a tree, a Lebanese cedar. "Their loss is not in vain," said Marine Lieutenant General Jan C. Huly. "And we will not break faith with them in the tasks we have ahead." The bombing of the Marine barracks was, as one speaker describe it, a "watershed" moment for this country, bringing home the horrors of terrorism. The blast was preceded six months earlier by a deadly bombing of the U.S. Embassy in Beirut. The U.S. military eventually withdrew from Lebanon, where it and France had gone to help bring peace to a country torn by civil war. A separate blast on the French compound in Beirut on October 23, 1983, killed 58 French service members. Relations between the United States and France have been strained by differences the two countries had over the war in Iraq. But the defense attache to the French Embassy in the United States, in his comments Wednesday, made a point of stressing the two countries' "enduring relation and common objective." "In this dangerous world, America and France must stand together," said Gen. Pascal Vinchon. Several speakers drew parallels to the between the 1983 blast and the September 11, 2001, terrorist attacks. "We did not know they would be the first casualties -- among the first -- in the war on terrorism," Huly said of the service members killed in 1983. No one has ever been held accountable for the 1983 blasts. David Satterfield, the deputy assistant secretary for Near Eastern affairs at the U.S. State Department, said efforts to find the culprits "will not cease." The tribute, an annual event, was organized by the White House Commission on Remembrance. The tribute was the brainchild of No Greater Love, an organization dedicated to remembering service members who have died in war or acts of terrorism. In the early morning hours of 23 October 1983, a truck loaded with explosives crashed through the security perimeter of the United States Marine Corps Barracks in Beirut, Lebanon. In the explosion that followed, 241 U.S. Military personnel were killed and 80 seriously wounded.These young people, on a mission of peace in a land stricken by violence, were killed as they slept. Twenty-one (21) of the young American victims of this cowardly act were returned to the United States and were buried near one another in Section 59 of Arlington National Cemetery. Near their gravesites is planted a Cedar of Lebanon tree which commemorates their sacrifice. They are remembered here in grateful appreciation of their sacrifice on behalf of freedom.